With the NHL's trade deadline just minutes away, the Flyers had remained quiet. And after the 3 p.m. threshold went by, every single Flyers player was still a Flyer. Or so it seemed. 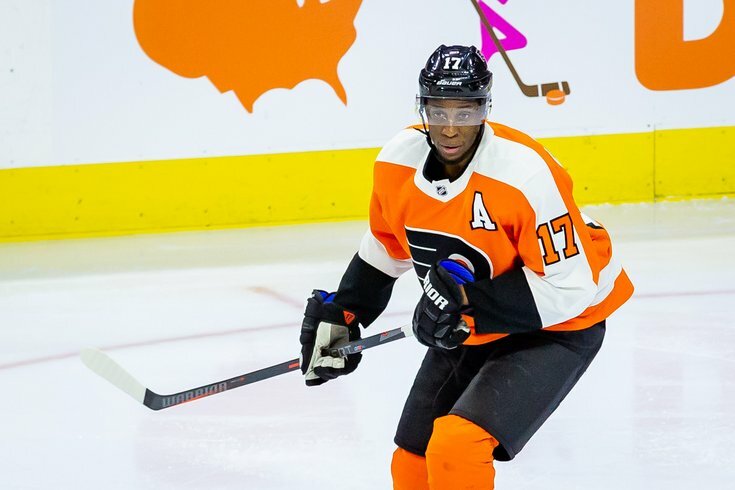 But then a report that came out just a few minutes after the official deadline was over that said Wayne Simmonds will have a new home in Nashville. It was later revealed the trade was submitted to the NHL at 2:57 p.m. The trade netted winger Ryan Hartman and a conditional 2020 fourth-round draft pick, much lower than the conditional first-round pick the Flyers were reportedly eyeing ahead of the deadline. Hartman and a 2020 4th that becomes a 3rd if Preds win a round to Philly for Simmonds. As it turns out, the Flyers had dug themselves in too deep with horrible play early in the season. Their incredible comeback win at the Stadium Series against the Penguins Saturday paired with their winter resurgence was not enough to make them a realistic playoff contender. According to TSN, Philadelphia has just over a 6 percent chance of making the postseason. A lot of balls are also being juggled by the Flyers, currently with regard to their roster. Carter Hart may return next week, and if he does the team will then have three goalies instead of the usual two with Elliott and recently acquired Cam Talbot. Radko Gudas is serving his suspension and Sam Morin looks close to being activated. The trend is clearly pointing up for the Flyers, who are 14-10-2 over their last two months of games and put together an impressive 10-game point streak in the middle of it. The morning on deadline began with an extremely high asking price for Simmonds — who has just 27 points in 62 games this season. It appears the Flyers were willing to back down and accept a smaller haul. Hartman is 24 and was the 30th overall pick in the 2013 NHL draft. He has 20 points in 64 games for the Preds this season. And, as previously mentioned, the pick was not all what the Flyers were hoping to get in return. Not a fantastic return for Simmonds, but at the same time, Hartman is a young player who is clearly NHL caliber & had a pretty darn solid rookie year back in 2016-17. The types of prospects PHI might have gotten back for Simmonds instead wouldn't really have more value than him. The Flyers have a deep pool of near NHL ready prospects (Morgan Frost comes to mind), and Philly is clearly looking to add to it. The decision is in stark contrast to recently departed GM Ron Hextall, who stressed patience. The Flyers sent him packing and wanted to take a new and more aggressive approach. This trade is indicative of that attitude.